Not for nothing was our review of the second volume, Handel's Operas 1726-1741, in this two-part series so positive. It's hard to see how either study could be bettered: they're likely to be the definitive studies of Handel's operas, and are already the standard works – thanks to their comprehensiveness, to the authoritative treatment and to their stylish and to their accessible presentation. This first volume was first published by Oxford University Press in 1987; a revised paperback edition came in 1995; and it then went out of print altogether and was by turns impossible and difficult to find (and then only at unreachably high second-hand prices) for over a decade. Now the ever-enterprising and reliable Boydell publishers have reissued this first volume to co-incide with the 250th anniversary of Handel's death. 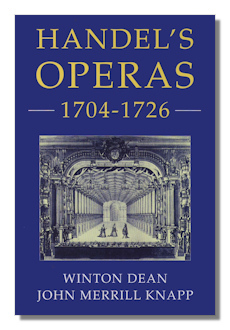 If you're an enthusiast of Handel's operas, you should not hesitate also to get this desirable encyclopedic and thorough treatment of the subject. It's a lengthy book at over 750 pages. The operas covered are: Almira, Rodrigo, Agrippina, Rinaldo, Il pastor fido, Teseo, Silla, Amadigi di Gaula, Radamisto, Muzio Scevola, Floridante, Ottone, Flavio, Giulio Cesare, Tamerlano, Rodelinda, and Scipione. Each work gets between a dozen or so and 40 pages to itself. The format for each work is similar to the way they are treated in the second volume: all important aspects are covered judiciously. Libretto/text, autograph, history, copies, and editions. Though additionally – again as in the second volume – grouped at the end of the book in seven appendices are tables of analysis covering the structure of the operas, their instrumentation, contemporary performances, borrowings, singers, modern stage productions to 1993, first lines; and a bibliography. It has to be noted that, given the recent revival of interest in almost all of Handel's operas, the modern production record is not really up to date: it runs only up to over 15 years ago. No matter, in every other way, the book's thoroughness and breadth make up for such a small omission. There is barely a spare word in Dean and Knapp's handling of each opera. As examples of critical examinations of the sources and wise contextualization in contemporary and modern aesthetical appreciation, they are spectacularly successful. Musical examples are judiciously incorporated. Sixteen relevant illustrations are gathered in plates towards the center of the book. Footnotes are plenty and references meticulously presented. Not that the detail – practical and factual – for each opera ever excludes sensible and appropriate critical musical discussion. The chapter on each opera would make an ideal companion to many a CD; and conceivably before and after attending performances. In addition to the opera-by-opera chapters Dean and Knapp are another half dozen or so chapters. These deal globally with Handel's stature as opera composer; performance practice; opera in Hamburg at Handel's time; his lost Hamburg operas; and his periods in Germany, Italy and England. These make good introductions to this aspect of Handel's operatic career as a whole, of course, and go some way to setting the scene for the material also included in the second volume. While the second volume was the work of Winton Dean alone (John Merrill Knapp died in 1993), this one benefits from the work of both authorities. The enthusiasm and infinitely painstaking inclusion of detail and relevant and revealing information shared by the two has blended extremely well. Although it is possible to distinguish who was responsible for what, this is the work of a team and can be relied upon for its distillation of both their wisdoms. Indeed, if there were ever any doubt as to the stature of Handel as an opera composer, and to the depth of his gift in the genre, the authors make the case conclusively – yet without undue insistence. It's also to be noted that in their qualitative assessments and statistical and factual comparisons (that Radamisto is the only one of Handel's operas whose later version has a strong claim to rank higher than its first, for example) apply across the wider range, 1704-1741. So, the reissue of this classic is a very welcome event. Yes, it's an expensive book. But one which will pay for itself very quickly as you use it with recordings and live performances. Given the age of Dean, it was felicitous that Volume 2 was finished and published when it was – a couple of years ago. Now we have the companion volume, thanks to Boydell, whose production standards are, of course, exemplary. Unhesitatingly recommended.